The American MGB Association held its 31st annual Meet on June 20 – 21, 2008 at Armagh near Pittsburgh, Pennsylvania. The event was held in conjunction with the annual Roadster Factory Summer Party. This event has been going on for many years and this was purported to be the last one. I will be sad to see it go but there were hints that it may be resurrected in a different format and not every year. On Friday, there was a barbecue picnic for the participants which consisted of hamburgers and hot dogs. They were then treated to music by Roadster Factory employee. The traditional Summer Party bonfire and a bedsheet drive-in movie showing “Animal House” followed the barbecue. On Saturday, many of the cars participated in a “poker rallye” consisting of 86 miles of scenic driving. Participants received a playing card at stops along the way. The winning poker won a cash prize. Technical and information seminars were given at the Roadster Factory headquarters in Armagh during the afternoon. Late Saturday afternoon, a downtown Indiana, Pennsylvania street near the Coventry Inn was closed off for the car show. The Coventry Inn is a British restaurant owned by Charles Runyan and he also serves at its chief chef. The cars lined up on the street in various classes awaiting popular vote balloting. A fine meal was prepared for each of the participants at staggered times so that a quality meal could be served. This also allowed for a three hour voting and display while dinner was being served. Secretary Margie Springer and myself handled the AMGBA awards presentation. It was great to meet many of our long time members in the this area of the country. Margie Springer and myself were kept busy all day signing up new members and providing other member services at the AMGBA table. The AMGBA wishes to thank Charles Runyan an John Swauger at the entire staff of the Roadster Factory and Coventry Inn for hosting the event. For information on next year’s event or on the American MGB Association, please contact the AMGBA, P. O. Box 11401, Chicago, IL 60611; phone: (773) 878-5055; email: meet@mgclub.org; website: mgclub.org . 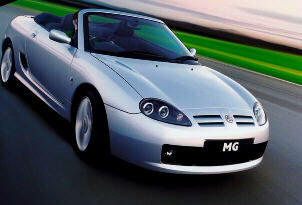 Revival of TF roadster shows the Spirit of MG is still alive and well! It’s the roadster revival of the decade! Auto Express can exclusively take the wraps off the car that’s sure to get British fans hot under the collar: the new MG TF. Emerging from the ashes of the famous company, the roadster is the first sign that the spirit of MG is alive and well, even though the brand is in the hands of Chinese owners. This stunning model is set to replace the existing TF – production of which is back on track at MG Rover’s old home of Longbridge in the West Midlands – and will go on sale around 2010. And there’s not only a convertible planned, but a coupe, too! The new TF is based around the Roewe 550 compact hatch, which made its debut at the Beijing Motor Show. It will feature a rear-wheel-drive version of that model’s platform – and this should ensure it has plenty of appeal for enthusiasts. Although it will be slightly bigger than the Mazda MX-5, the MG will be targeting the Japanese convertible, as it’s likely to carry a similar price tag. However, also in its sights are the likes of the Alfa Romeo Spider, Audi TT Roadster and Volkswagen Eos. If it looks a little familiar, that’s because the new TF takes some of its styling inspiration from the MG SV supercar and X80 concept. Those models were both based on the Mangusta – a sports car from Italian maker Qvale, which MG Rover bought in 2001. As you can see from our pictures, produced using insider information, the new TF updates that shape with a striking front end incorporating a deep-set four-piece radiator grille and quad headlamps. At the rear, the curvy tail completes the look. Under the skin, the TF features a chassis based on a design that was created by MG Rover – one which would have underpinned a replacement for the 45/ZS, had the company not gone into receivership. When Shanghai Automobile Corporation (SAIC) bought the rights to the 25 and 75, it also acquired projects such as the unfinished 45. It has since produced the Roewe 550 and the 75-based Roewe 750. There has always been the desire within SAIC to build a replacement for the TF, but with rival Nanjing Automobile Corporation (NAC) owning the rights to the MG badge, there was never any chance of it wearing the famous octagon emblem – until the two Chinese giants joined forces. Featuring a rear-wheel-drive platform developed in conjunction with British engineering expert Ricardo, plus MG Rover-based engines – including a 1.8-litre turbo and 2.5-litre V6 – the TF will deliver a great driving experience. And as SAIC-NAC are looking to form a UK Roewe dealer network in 2010, the stage is set for the TF’s comeback. Since its launch in 1995, the MG TF – or MGF as it was then – has won a loyal following thanks to its neat looks, mid-engined layout and driver-pleasing handling. When MG was bought by NAC in 2005, the TF was one of the first cars the Chinese firm wanted to get back into production at Longbridge – and as soon as possible. It revealed a mildly revised version in 2007 called the TF LE 500, which had a new bodykit. Since then, production has been delayed, first when bosses were concerned about quality and then when a key supplier pulled out. However, it now seems that new (current) TFs will start rolling out of the plant within six months. Buyers looking forward to the roadster will have to wait for another couple of years, but it appears MG has a brighter future.